Synopsis: A widow hires a gunman to retrieve loot hidden by her deceased husband. John Wayne (The Undefeated, The Shootist) was approaching the end of his career when he made this Western, and his age is showing. He’s still mobile, but he’s shot mostly standing still or sitting on a horse. He plays the leader of a group of men hired by the comely widow Ann-Margret (Made in Paris, 52 Pick-Up) to recover and return the money her recently deceased husband robbed from a train. It’s buried in some remote location, and they have to traverse desert followed by a largely featureless posse straight out of Butch Cassidy and the Sundance Kid. Only this isn’t a posse – it’s a gang of cut-throats working for dastardly Ricardo Montalban (Across the Wide Missouri, Sweet Charity), whose jaunt through the desert barely dents his seemingly inexhaustible supply of King Size cigars. 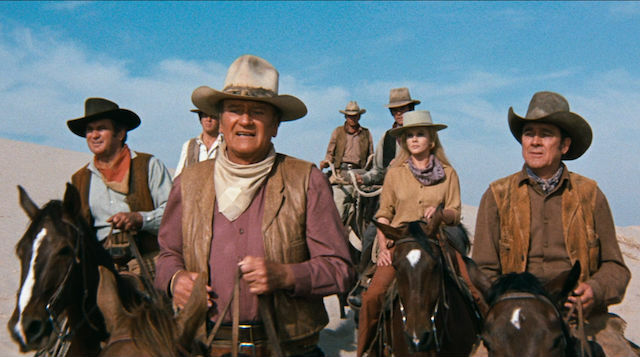 The Train Robbers is fairly typical of the kind of mainstream Western being made in the late 1960s and early 1970s. It’s big and brassy with a rousing score, but it’s essentially empty and contains nothing of any originality. It has some good points, but not many. Ann-Margret looks good in tight jeans on a horse, and the location photography is impressive. The story is pretty dull, though, for what is basically one long chase. This is mostly because there’s no conflict to speak of within Wayne’s group – Christopher George initially looks like he’ll provide some, but his character does a complete about face about half-an-hour in – and Montalban is seen only now and then.